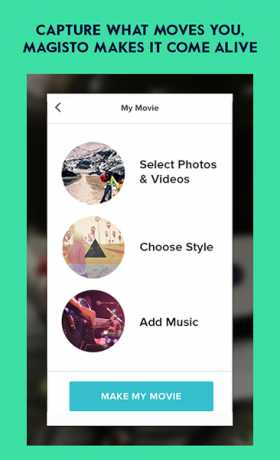 Magisto Video Editor & Maker automatically turns your video clips and photos into awesome edited movies, complete with your choice of music, cool graphics, and effects, in just a few magical minutes! Best of all it is free to download. Magisto has over 30 million users, has been featured in Google Play Editors’ Choice and on the Google Play homepage in 129 countries. Most recently, Magisto was included in Google’s list of Best Apps of 2013! We were also featured in CNN, TechCrunch, Mashable, Wired, VentureBeat, GigaOM, The Next Web, CNET, and Forbes! “Photo Movies”! Create sensational movies using as little as 5 photos. Imagine a personal photo editor combined with your own video editor, available 24/7 to transform your photos into movie masterpieces, in minutes! The easiest way to turn plain pictures into captivating stories. You don’t have to be a video or photo editor or know anything about video or photo editing at all. Magisto will analyze your video and photos and splice it together for you, creating a professional looking movie—an edit that you’ll be proud to share with your friends. 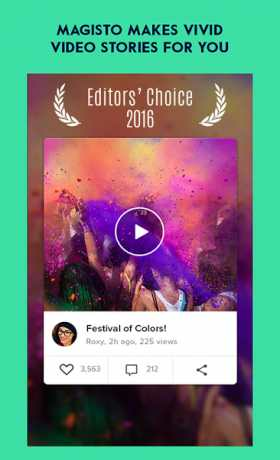 – Add Instagram photos, mp4 movies, and more! – Wide variety of editing styles such as Holiday, Indie, Travel and more!